Large surveys are becoming increasingly available for public use, and researchers are often faced with the need to analyse complex survey data to address key scientific issues. For proper analysis it is also important to be aware of the different aspects of the design of complex surveys. Practical Methods for Design and Analysis of Complex Surveys features intermediate and advanced statistical techniques for use in designing and analysing complex surveys. This extensively updated edition features much new material, and detailed practical exercises with links to a Web site, helping instructors and enabling use for distance learning. * Provides a comprehensive introduction to sampling and estimation in descriptive surveys, including design effect statistic and use of auxiliary data. * Includes detailed coverage of complex survey analysis, including design-based ANOVA and logistic regression with GEE estimation. * Contains much new material, including handling of non-sampling errors, and model-assisted estimation for domains. * Features detailed real-li fe case studies, such as multilevel modeling in a multinational educational survey. * Supported by a Web site containing software codes, real data sets, computerized exercises with solutions, and online training materials. Practical Methods for Design and Analysis of Complex Surveys provides a useful practical resource for researchers and practitioners working in the planning, implementation or analysis of complex surveys and opinion polls, including business, educational, health, social, and socio-economic surveys and official statistics. In addition, the book is well suited for use on intermediate and advanced courses in survey sampling. 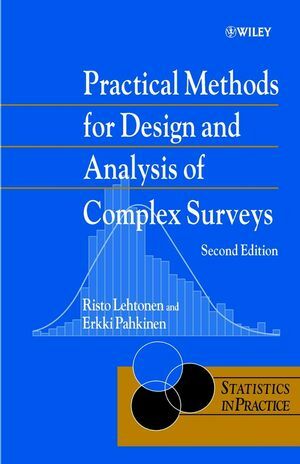 Risto Lehtonen and Erkki Pahkinen are the authors of Practical Methods for Design and Analysis of Complex Surveys, 2nd Edition, published by Wiley. 2.3 Simple random sampling and design effect. 2.4 Systematic sampling and intra-class correlation. 2.5 Selection with probability proportional to size. 3. Further Use of Auxiliary Information. 3.4 Efficiency comparison using design effects. 4.3 Chapter summary and further reading. 5. Linearization and Sample Reuse in Variance Estimation. 5.1 The Mini-Finland Health Survey. 5.5 Comparison of variance estimators. 5.6 The Occupational Health C are Survey. 5.7 Linearization method for covariance-matrix estimation. 5.8 Chapter summary and further reading. 6. Model-assisted Estimation for Domains. 6.1 Framework for domain estimation. 6.2 Estimator type and model choice. 6.3 Construction of estimators and model specification. 6.4 Further comparison of estimators. 6.5 Chapter summary and further reading. 7. Analysis of One-way and Two-way Tables. 7.3 Preliminaries for tests for two-way tables. 7.6 Chapter summary and further reading. 8.2 Types of models and options for analysis. 8.3 Analysis of categorical data. 8.4 Logistic and linear regression. 8.5 Chapter summary and further reading. 9. More Detailed Case Studies. 9.1 Monitoring quality in a long-term transport survey. 9.2 Estimation of mean salary in a business survey. 9.3 Model selection in a socioeconomic survey. 9.4 Multi-level modelling in an educational survey. In addition to the printed book, electronic materials supporting the use of the book can be found in the web extension.